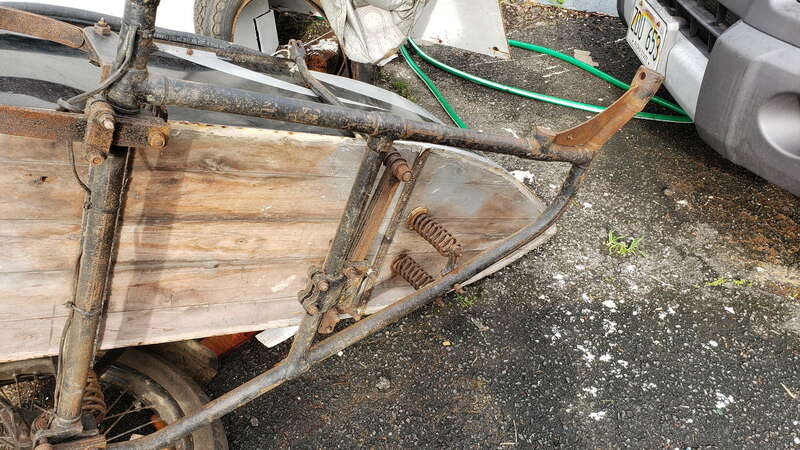 Register Log In Britbike forum Forums Britbike sidecar forum can anyone id this sidecar? I recently bought a 1949 BSA M21 with a sidecar. 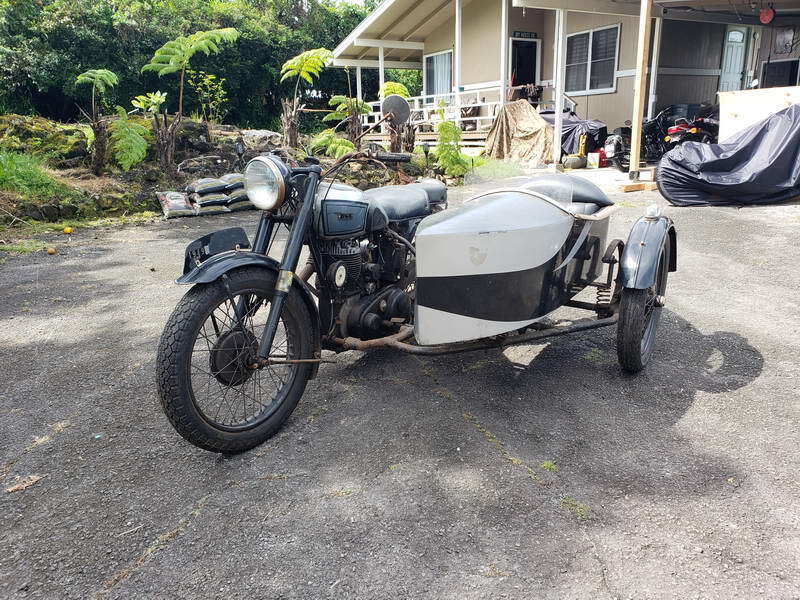 Originally, the motorcycle was sold through a dealer in South Australia but currently it's in Hawaii which is a bit odd. 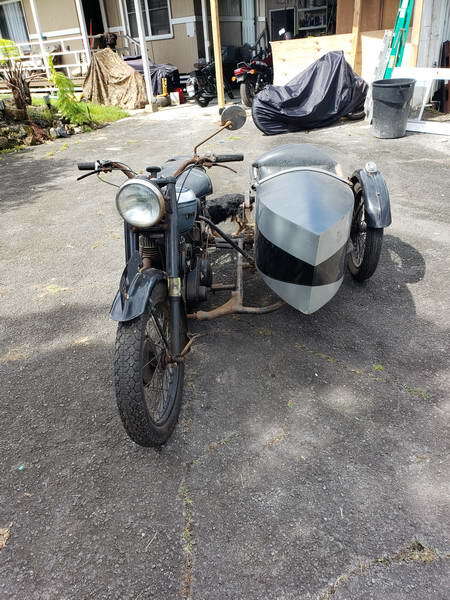 I can not identify the sidecar and I was hoping someone might be able to tell me something about it. Last edited by cas.vanderwoude; 11/22/18 7:07 pm. My initial thoughts was that maybe it was a Goulding, which were made in Oz before they moved production to the USA. However, it is pointy at both ends, which is not yer usual Goulding. Boat style sidecars were popular over a long period of time, as you probably know. and one pic I saw while googling this just now had an outboard engine attached to the back !! Very nice home-built body on a BSA chassis. 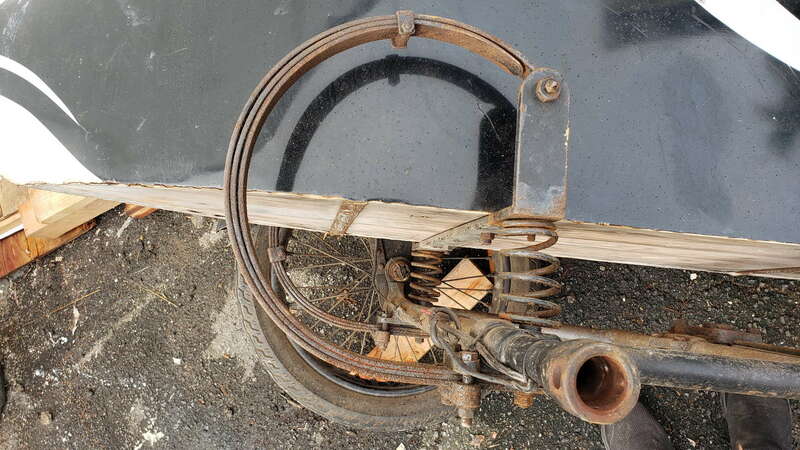 Two small coils springs at front of chassis would identify it as BSA- postwar BSA chassis used flat leaf sprigs, the ones you have are pre-war. Put these photos up on the Fed facebk group's site- They will know. there were dozens of makers, imported sidecars cost an arm and leg, because of the import duty. So its very unlikely to be 'home made'. 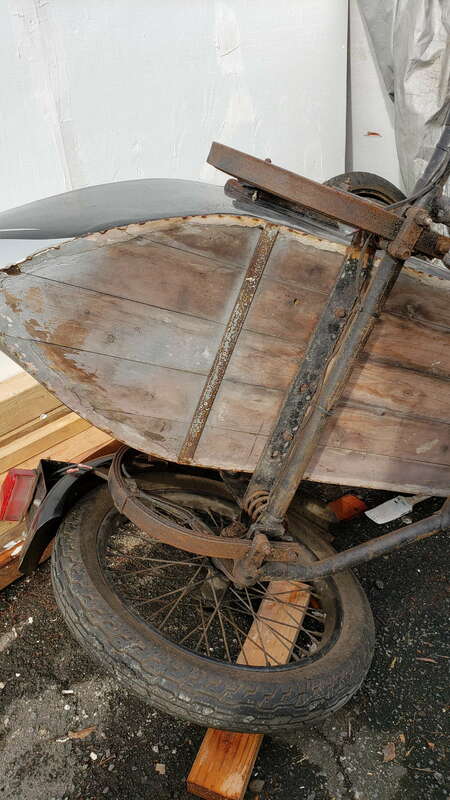 Dusting and Goulding come to mind because of the shape, and boat shaped sidecars were popular at one time. I've seen something like that before, let me ponder on it. Goulding sold so many sidecars into the USA that they up and moved production there at some point. Didn't notice it was from OZ. One evening on the net I counted 23 Australian sidecar makers, from factories like Tilbrook to tin sheds in the middle of nowhere. A book about them needs to be written. Firstly, back in the 70's the late Wal Maynard of the Victorian VMCC wrote a surprisingly lengthy series on Australian made outfits for the monthly Club magazine, one make at a time. As we were required to provide copies of each magazine to both State and Federal bodies it is theoretically possible to track these articles down and study them but as the paper we published the Club mag on wasn't chosen for it's archival qualities I wouldn't be too confident on it's current condition. But you never know. Secondly, it was the sidecar BODIES that attracted hefty import duties, not the chassis. In horse drawn days the building of all the various horse and bullock drawn vehicles was a big industry here that rapidly went down the gurgler as the motor vehicle took over. They fought back hard and by the early 1920's had the Federal Government slap heavy import duties on all vehicle body work that could be done by local labour. Hence the great majority of all Australian motor vehicles across the board had Australian made bodies. Sidecar chassis were a different story. Few were imported as they failed in Australian conditions. They were invariably too stiff and inflexible and couldn't stand the battering given them by local roads. 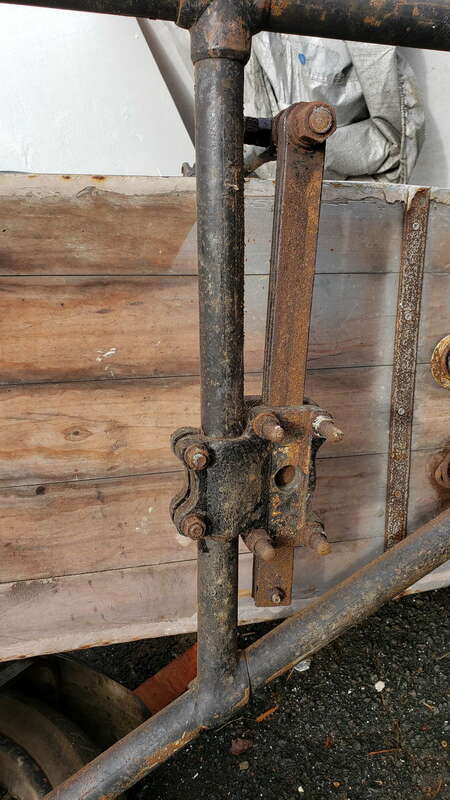 The whole point of early Australian made sidecar chassis was that they had a certain degree of flex built in. What they nowadays call 'compliance'. It's worthwhile having a good look at the common Oz Dusting chassis and comparing it with the English BSA one in the photo. You'll note the big Silentbloc bushes on the Dusting. Australian chassis didn't break. It's not a big problem nowadays as the roads are so much better but it was when the sidecar was king. 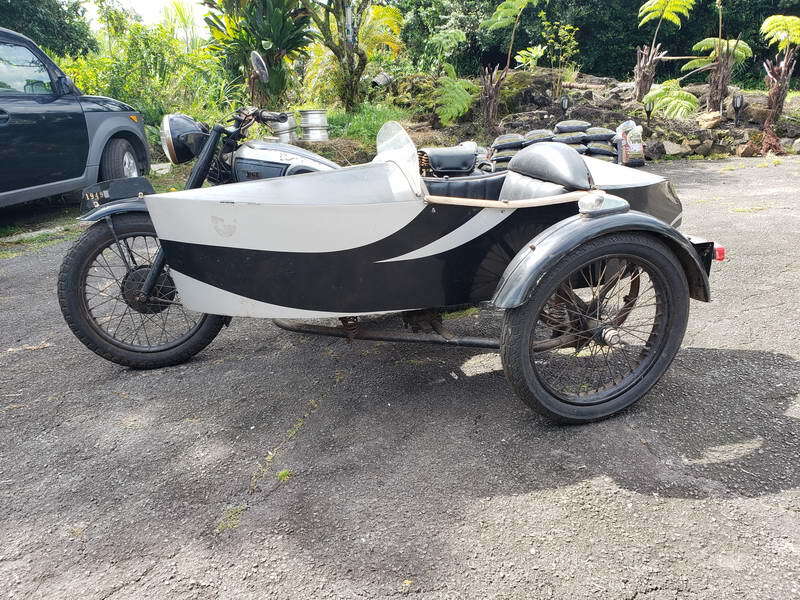 The BSA chassis won't be problem in Hawaii. You have good roads and short distances. It's be a lot of fun. Thanks for that information. I may try to contact the Vic VMCC. I've done a little digging and have a little more info for you on the Wal Maynard articles. The club magazine is called 'Exhaust Notes" and a full set of copies is held by the State Library of Victoria. The Club started as the Motorcycle Collectors Club of Victoria but fairly soon renamed itself the Vintage Motor Cycle Club of Victoria. The Club magazines are held in the State Library under the original name. The State Library of Victoria has its own website with a good search engine of course and all you have to do is bring up the site, search 'Exhaust Notes" and up it comes. They then fetch them out of the archives for you. This is fine if you are a local but a bit tricky in your position. I would doubt very much the VMCCV itself would be of much help. All the old boys from that era are long gone with the young buck remnants like me now very much in old boy mode. I doubt they themselves hold a full set of Exhaust Notes. They didn't in my time. Nevertheless it may be worthwhile contacting them. There might be someone as curious as you who can spend the time looking in the library. I find the State Library dangerous. It's just got too much info. The more you look the more there is to see. Our State Library occupies a unique niche. After Federation in 1900 the early Federal Parliament sat in Melbourne until 1927 when it moved to its present home in Canberra. In those days libraries performed the same research function as does the web today so having both State and Federal politicians using it meant it acquired a massive collection of Godwot. For early days motoring/motorcycling it takes a lot of beating. Unfortunately finding stuff requires physical searching page by page so it's slow and you keep finding other fascinating stuff. Anyway, the information is there. It's just a matter of somehow digging it out. Well! I'm a retired librarian, so this is like putting the hare in front of the hound! Thank you very much! Asked at that great library via e mail about old periodicals, unfortunately one must have an Aus. telephone number to communicate with them. Curses! I don't think the chassis is BSA, ! Well oddly enough I was browsing through the Barnstormers NZ site over the weekend and found they have put up the BSA 1939 catalogue for our pleasure. The BSA Special Sports sidecar Model 21-44 shown there is markedly similar to this one even down to the little bustle in the backside. In fact given the usual illustrators licence in prettying up things for catalogue use I'd say it was the same. hi Villiers - I think you have solved the mystery! 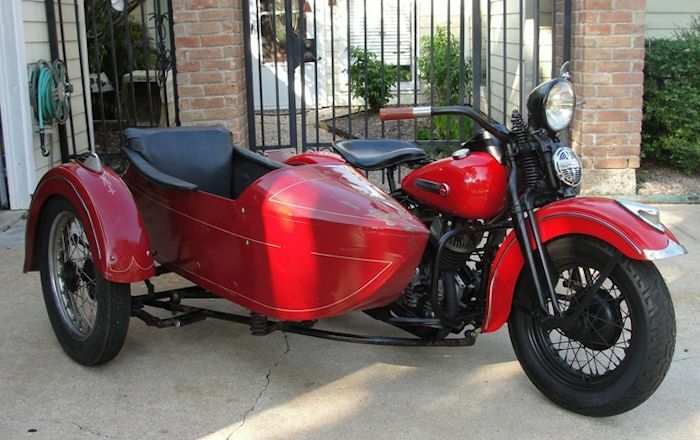 Sure looks like that sports sidecar from the 1939 catalogue - right down to the paint design. But why is there a steering wheel in the sidecar? Last edited by cas.vanderwoude; 12/05/18 12:00 am. Not a steering wheel, it's a chrome plated hand rail. Yes I will agree about the sidecar body id. I agree with John. The body may be BSA but the chassis is different and a three point mounting chassis has never been popular in Oz. It was never any drama to shuffle around various bodies and chassis. We're not exactly talking aerospace engineering here and a stylish sporting body was always something to hang on to even if the chassis was a wreck. I'm more curious about it's Australian history. I doubt very much that it was an official import through a BSA agency. It would be both too expensive plus known to have a chassis not built for Australian conditions. It's possible an incoming migrant brought it with him. This was the classic 10 pound Pom days and quite a few bikes came in that way. I knew of a "Built like a Bridge" Fanny Bee that came in that way. Then again since the 90's there has been a steady stream of 'classic' imports and exports with people making a steady living from the practice. At least it seems to have found a good home now. Few M21 would have left the factory with the expectation of ending up in Hawaii. 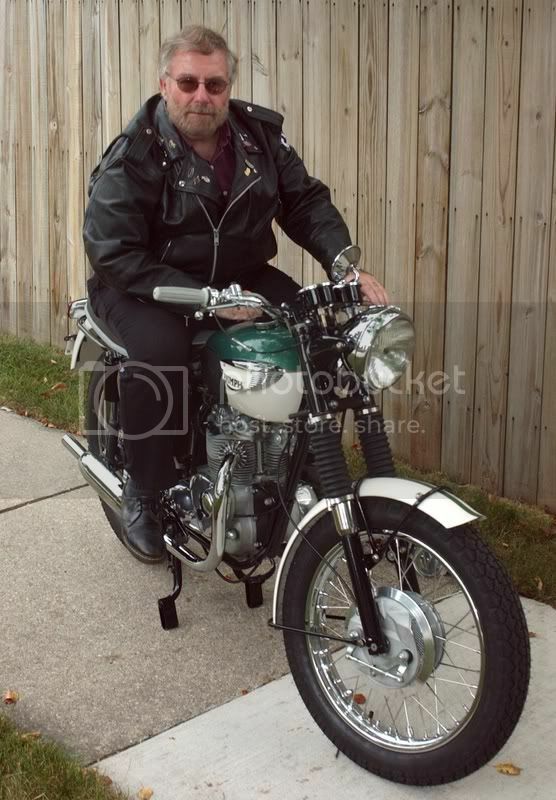 The motorcycle it was attached to was sold new in 1949 by a dealer in Adelaide according to the BSA dispatch records. It is remarkably stock with almost no later modification. 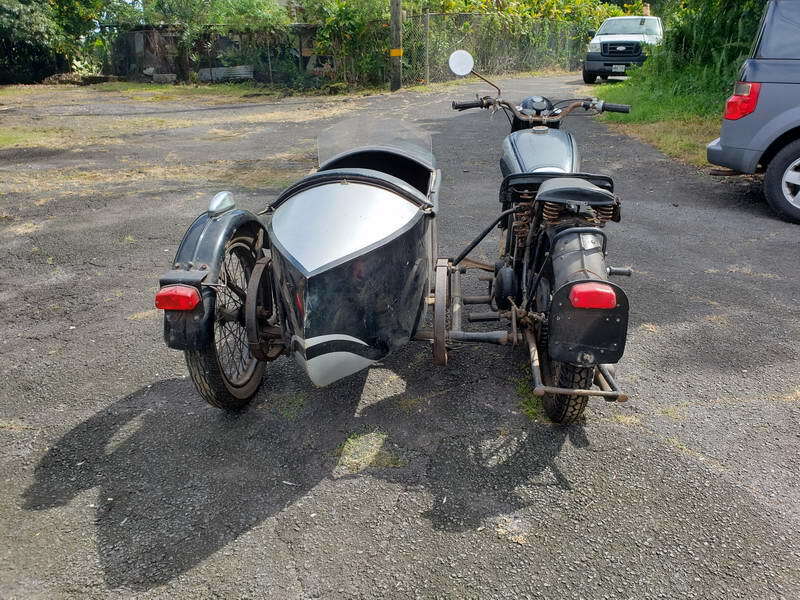 The sidecar body is painted to match the motorcycle but in the original BSA pattern (apparently they were painted blue as standard, and another option of color matching to the mated motorcycle. I think they have been paired together for a long time. The wear in the fork stanchions and bushes is so bad there is around 1/2 to 1 inch play forward and aft, I'm assuming from many years of heavy sidecar work. The chassis is still a mystery but on the weekend I'll try to tip it over and get a better image. 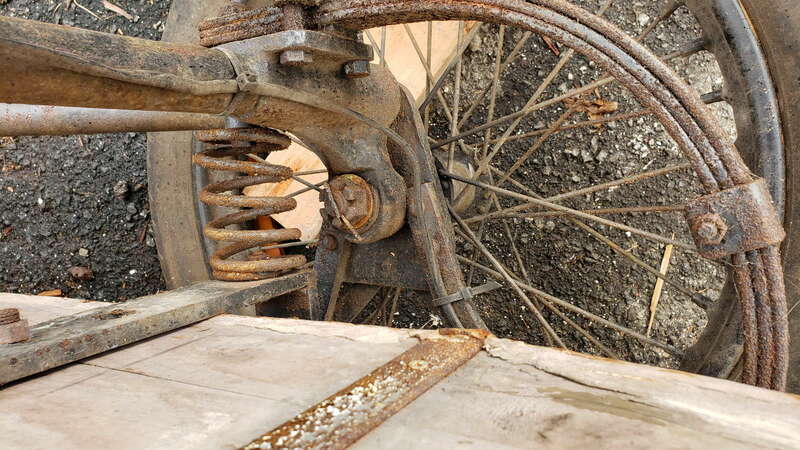 The running light on the wheel is an Australian item (Hella, made in Aus) so would have been attached at some time after original manufacture. 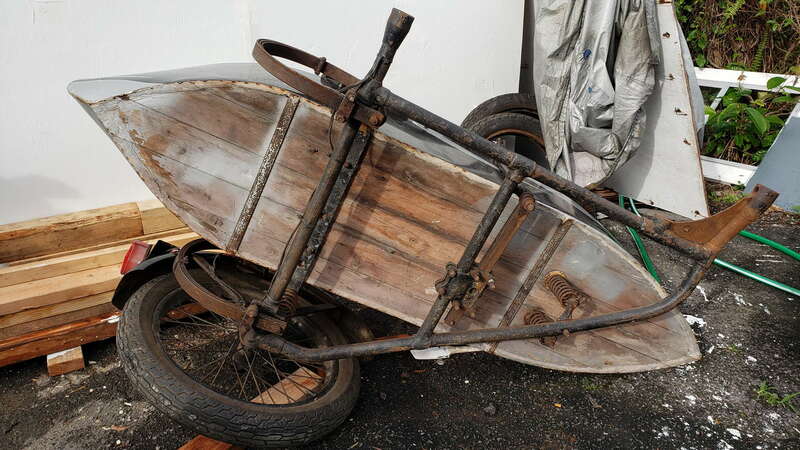 And yes, the chassis is attached to the motorcycle by adapter plates which Chaterlea tells us is not correct for a BSA chassis. However, I'm assuming that connection points differed depending on which model BSA the chassis was originally designed to fit. Also there seem to be three distinct BSA chassis designs (compare the 21-44 with 21-42 and 6B6). This bike was probably already in Hawaii by the 90's as far as I can work out, so probably arrived here earlier. All in all it's an interesting package for me. Factor in that I was born in Holland just a few dozen miles away from where it was built, immigrated to Australia in the 1960's, before moving to Hawaii, and it seems I'm chasing this old girl around the planet! It's the only M21 on this island although there are also 2 M20's (one of them mine). Not bad for a little island with 100,000 people. Here are a few images of the undercariage. 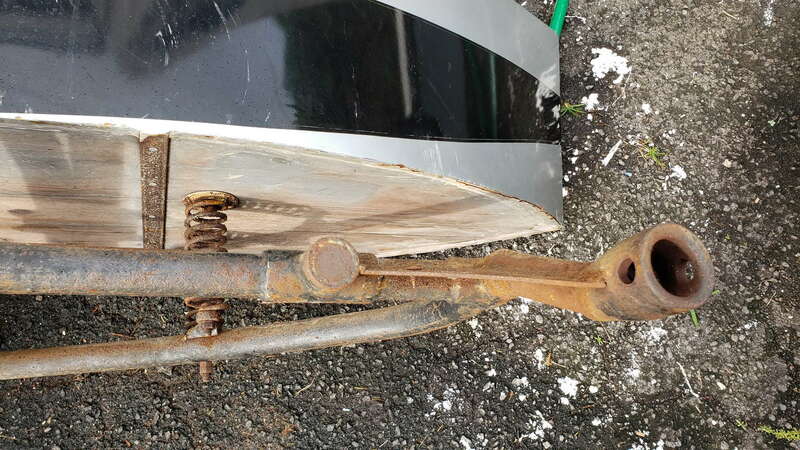 It looks like someone has made some alterations to the front mounting points, removing one and to me, it looks like the stub was re-attached to where the front upper mount would have been. I could easily be wrong (as I have been for most of this thread). Last edited by cas.vanderwoude; 12/10/18 2:25 am. Much as described in an earlier post to allow for flexing on poor condition roads ??? I have not seen such an arrangement before ? Hi, it looks well made and Australian?